For those who have not yet played a bit with the animation of the new logo, they can do so by moving the cursor inside (to resume animation) or outside (to pause animation) of the logo in the top left corner. If you want to know all the details about how it was implemented, just keep reading! One of the first things we had to do was to keep the waves inside the cup. With this region in place, we could start to build the waves and animate them. As you can see, the basic structure is quite simple. We have an image, which is the empty cup in the logo, and some SVG elements to build the animation. It is a simple SVG path, which we have built supporting us in a tool to build SVG paths like waves, that we already used in a previous tutorial. The other wave was created using the same tool, testing different parameters and positions, to make our new logo as close as possible to the original. Later in this tutorial we will see how we added that third color! With the waves in place, the most anticipated moment arrived: Animate them! Actually we thought of a fairly simple animation, so that it would run smoothly, but that it would fulfill the main objective of being attractive enough. That&apos;s why we decided to animate the waves (SVG paths) with CSS translateX transformations, in opposite directions, and with a slight offset to give a touch of randomness. To add the third color, corresponding to the intersection between the waves, we thought of several options. The first option that came to mind, was to use SVG filters to blend the two waves and get the third color. We quickly discarded that option because it did not have adequate browser support, and we would not have absolute control of the resulting color. So then we thought about using a new clip-path, where the clipping region would be a copy of one of the waves, and the clipped region would be a copy of the other wave. Then we could arbitrarily assign any color we wanted to the intersection between the two waves. To also animate these copies of our original waves, we only had to add the new selectors to the CSS code that we already had, nothing more. Just after adding the color of the intersection between the waves, during the tests, we could verify that all the browsers ran the animation without problems, except Firefox. Firefox does not allow to animate with CSS the elements that have been defined within the defs tags, in our case the clip-path element. This is not a bug, since Firefox is honoring the SVG specification in this regard, being the other browsers those that allow a little more liberties. But for practical purposes, this was definitely an issue that we had to solve, or at least find a workaround for, since the animation did not looks good. Hide the third color initially through a CSS class. Detect if the browser that was being used was Firefox. In case of NOT being Firefox, we remove the CSS class, to show the third color properly. So far, the animation looked great, but we just wanted to add another small detail: drops. 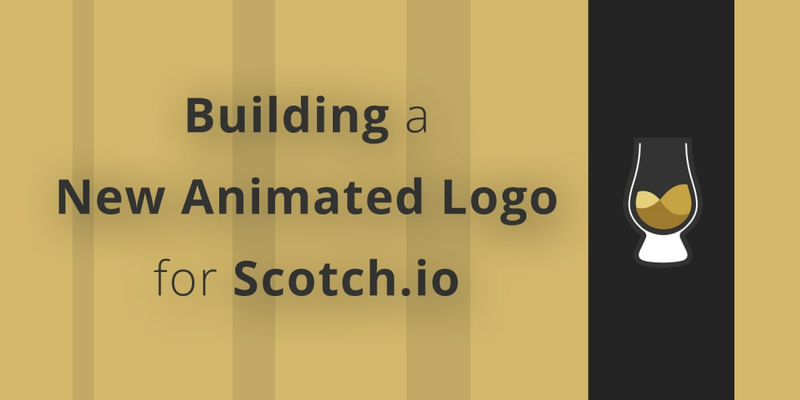 And that&apos;s how we managed to develop a nice and simple animation for the logo of the new Scotch.io site. If you want to see the complete code, or even play with it, you can do it in the Codepen demo. We hope you have enjoyed this tutorial and that it has been useful! Develop an elegant and functional Portfolio Carousel to get the attention of your potential clients.